While Wells Fargo has yet to identify exactly how a problem at a server facility in Minnesota took down its operations nationwide, observers pointed to possible gaps in the bank’s emergency backup contingency plans that prolonged an outage that lasted some 24 hours. Experts agreed Wells undoubtedly had a blueprint in place for a systemwide failure, but that it’s impossible to test for every type of situation. Wells’ troubles started early Thursday morning as it was forced to shut down a facility when “smoke was detected following routine maintenance,” according to a statement from the bank. What followed was a nationwide outage that affected Wells’ online and mobile banking capabilities, its ATM network and card processing. The outage also extended to the bank’s call center where an automated message told customers that bankers were unable to access account information. Customers peppered the bank on Twitter with questions about how the outage was disrupting routine tasks such as paying for gas and bills or transferring money via the Zelle person-to-person network. 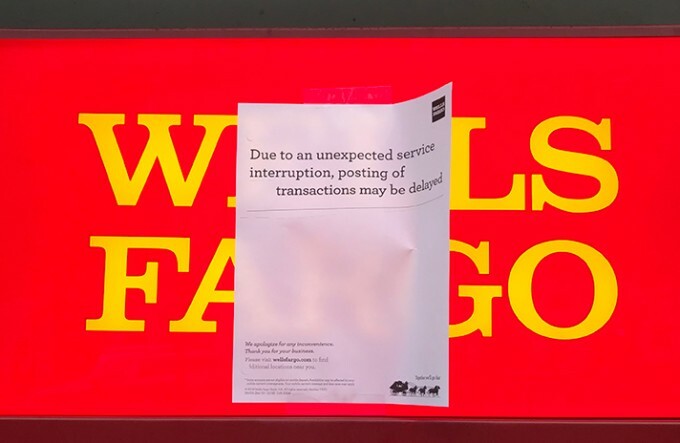 Sign posted on a Wells Fargo ATM alerted customers to potential transaction delays. As of Friday morning, Wells said its operations were back to normal. Still, customers on Friday wanted to know how a disruption at one facility could cause a nationwide shutdown. Wells has yet to answer any questions about why the outage lasted as long as it did, but emphasized in Twitter updates that it has not fallen victim to a cybersecurity event. Tim Sloane, the director of the emerging technologies advisory service at Mercator Advisory Group, said that in the right scenario, Wells’ backup system in a different location would have recognized the problem at the Minnesota facility and stepped in to handle operations. Sloane added that it’s unusual for a bank to have all its channels connected the way Wells did. Sloane said even the smallest institutions have an arrangement with the card networks to process transactions should the bank’s systems falter. As for whether Wells could have prevented an extended outage, it might have come down to the testing procedures the bank has in place. “The question enterprises should be asking themselves is that how can I guarantee that when disaster strikes, I can actually recover everything in an acceptable time frame,” said Doron Pinhas, the chief technology officer of Continuity Software, an Israel-based IT company that works with financial institutions worldwide. “I think what most likely happened is that Wells did not pay enough attention and did not have enough controls and prior testing in place to get operations back up and running in an acceptable time frame,” he said. Pinhas noted that a cloud-based system would not have mattered in this situation because such technology is still susceptible to human error. “There would have been absolutely no difference” if Wells was completely on a cloud-based system,” he said. “Most of the reasons why you have outages is because of the human factor. “When you’re working on large systems, you have a lot of people involved with planning and sometimes communication between those people is not what it should be,” he added. Wells was already under scrutiny for a number of scandals. The $1.9 trillion-asset bank recently revealed a change in its business practices at a time when it is facing pressure from Congress about its operations. Pinhas said he expects regulators to press the bank on why it took so long to recover from this outage. “If there is a silver lining, it is that such incidents can help these institutions be better prepared for future business continuity challenges,” Inscoe said.